I love heated car seats. My sister has them, my brothers have them, but I do not. I am a practical person and really do not like wasting money on all the bells and whistles when it comes to my car. 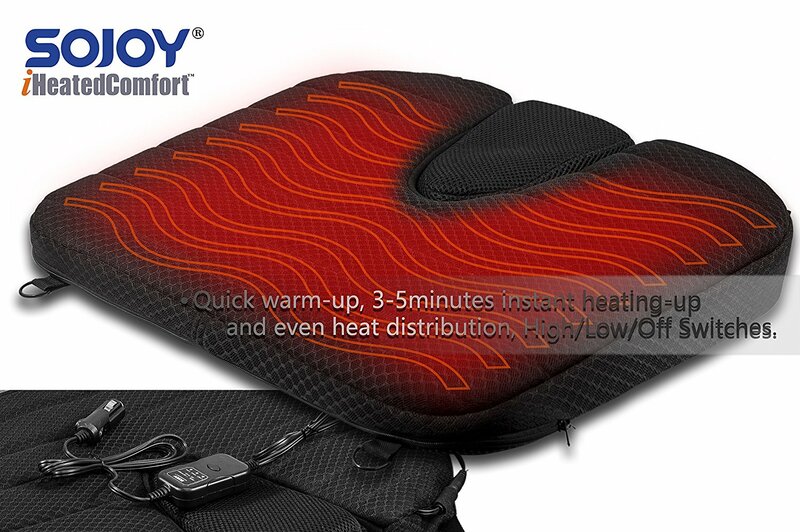 Recently I discovered the SOJOY portable heated car cushion. Let me pause here a moment and do a little happy dance. SOJOY car seat is so easy to use. It just plugs into your car outlet. It takes 3-5 minutes to heat up. That's it. It is so simple and convenient and now I can have a heated seat any time, any where I travel. The seat itself is super comfortable with nice cushioning. It even has a removable orthopedic wedge for added pelvic support. The seat is reasonably priced around $50 and available on Amazon. Check out my Youtube video review for more details. QUICK WARM-UP AND EVEN HEAT DISTRIBUTION: A Universal fit for DC 12V vehicles with standard car seats. 3 Heat levels: High/Middle/Low/Off Settings. Timer runs on 45-minute time intervals. Heats up to 50 degree Celsius Surface temperature! REDUCE YOUR BACK PAIN: Removable Orthopedic wedge tilts the pelvis to improve posture and relieve pressure on lower back and spine during long car drives. Remove the wedge for the ergonomic coccyx cutout option to reduce tailbone pain and sciatica. INNOVATIVE DESIGN: No-flatten design technology combines soft and comfortable breathable polyester fabric with dense ventilated mesh material and memory foam comfort. STAYS IN PLACE: Adjustable easy, non-slip attachable strap and elasticated belts and hook & loop buckle fastener goes around back of car or truck seat to keep cushion secure and fixed in place. It will not move around when driving or need constant readjusting. PERFECT FIT FOR YOUR VEHICLE: Delivers comfortable support and heat and fits into most car seats without any problems. Size: 18.5 x 16.2 x 3.1 inches. I have heated seats in the front and just love them. I’m sure these would be perfect for cars that don’t have heated seats.